Place shrimp in a shallow bowl or plastic storage bag. Add Citrus Rosemary Sauce and stir shrimp to coat on all sides. Cover and refrigerate 30 minutes – 2 hours. Preheat oven to 400 degrees F. Place bacon on a rimmed baking sheet, make sure strips do not overlap. Bake about 6-10 minutes until just starting to crisp, but still pliable. Drain grease from pan and wipe clean. 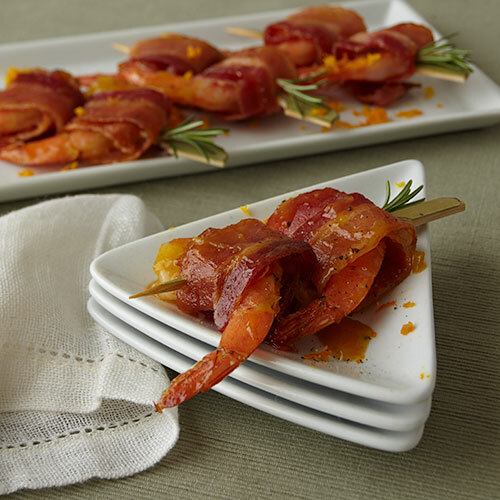 Reduce oven temperature to 350 degrees F.
Wrap each shrimp with one strip of bacon. Place on baking sheet seam side down. Season with salt and pepper. Bake 10-15 minutes until the shrimp are pink and bacon is crisp. Turn shrimp over half way through the cook time, being careful that the bacon remains wrapped. Insert a toothpick into each shrimp. Garnish with rosemary and fresh orange zest. Serve with a small dish of fresh Citrus Rosemary Sauce (not the sauce the shrimp was marinated in).